Creating a landing page with Landing Cube is easy as could be. We do most of the work for you, by gathering the information from your Amazon product page. Keep reading for more detailed instructions. 1.To get started, sign in, and select “New Campaign” in your LandingCube Dashboard. You will need to choose which type of Campaign you wish to create: a Promo Page, Product Page (landing page with no coupons), Messenger Landing Page or Click-to-Messenger Ad. Note: Messenger campaigns are available only on the Full-Time Seller and Large Business plans. 2. You’ll be taken to the “New Campaign” screen. Here you start creating your campaign by providing the “Basics”. A. Provide a URL to your product on Amazon. We will grab most the required Information from your product using this URL, including the original price on this screen. C. Choose your promotion price (make sure it is the same discount as the promos you will create in Amazon). You can either select the new price or the percentage discount you will offer the customer. D. Choose the Start Time and End Time for your promotion. These can be modified at any time. E. Hit “Save and Continue” when finished filling out this page. 3. Next is the “Design Page”, it’s time to actually design your landing page. We will have already collected much of your product info using the URL provided. This includes your products name, price, images, about section, and reviews. You can of course modify all of this. Navigate the design page using the options on the left, or by clicking on the element you want to change. B. Product: Here you can change the Product Details. This Includes headline, product name, and images (the order can be changed, or you can delete/add new images) . You can choose whether to show the percentage discount or dollar value saved; you can show or hide the number of coupons used/remaining; and you can select "artificial scarcity", which shows a random number of coupons remaining, always less than 15. C. About: You can alter the headline and body of the product description below your offer section. E. Reviews: On by default, you can completely disable the reviews section if you’d like. We will already have pulled in your reviews from the URL provided. You can modify the reviews by clicking directly on them, or remove, or add more, in the left. F. FAQ: Also enabled by default, you can remove the FAQ section as needed. It’s purpose is to provide important information about your promotion, and product. It will already be populated with some relevant questions and answers. These can be modified by clicking on them, and you can remove, or add more over on the left. Once you have your landing page customized to your liking hit “Save & Continue”. 4. The next page will be where you set up your email options, the requirements for customers to claim your coupons, and your integration options. -Select whether the customer needs to enter their email to receive the coupon (required if you wish to put together an email list). -Choose whether you require the customer to provide their first and/or last names when claiming the coupon. -Integrate with your email marketing provider to send them your subscribers information. -Choose whether to require the customer to receive the coupon via the email provided. This will help protect against abuse, and verify that the emails you collect are live and useful. 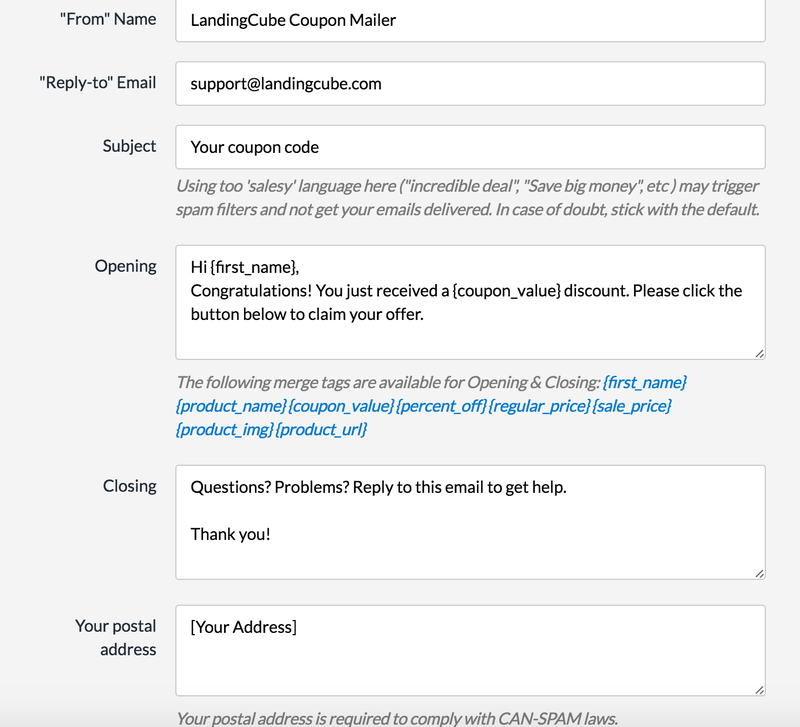 -Customize the email sent to your customers with your coupon by clicking on "Set Promo Email Settings". Finally, choose your advanced settings, including Facebook Pixel/Google Analytics tracking. Hit “Save & Continue” once you’ve finished. 5. Next is the “Publish” screen. All that is left to do here is add your promo codes and assign your landing page a URL on our site. If you have your own site you would like to publish your pages on, an iframe code will be available to you after publishing. You can also set a daily limit for the amount of promo codes you wish to give out. Once done, hit “Save” and you will be returned to your dashboard. Your landing page is now ready for you to drive traffic to, and begin running your promotion.